Spanish month has begun, and I can’t sit still because I want to try all the recipes. Spanish cuisine is incredibly diverse, and any part of the country may have their own dishes that are unique to that region. My goal for this month is to explore as many dishes as I can – including those that are more obvious (hello Spanish Tortilla) and some that are a little unknown. Many feature simple ingredients, cooked to perfection and special attention is given to single ingredients to bring out the best of what they have to offer. 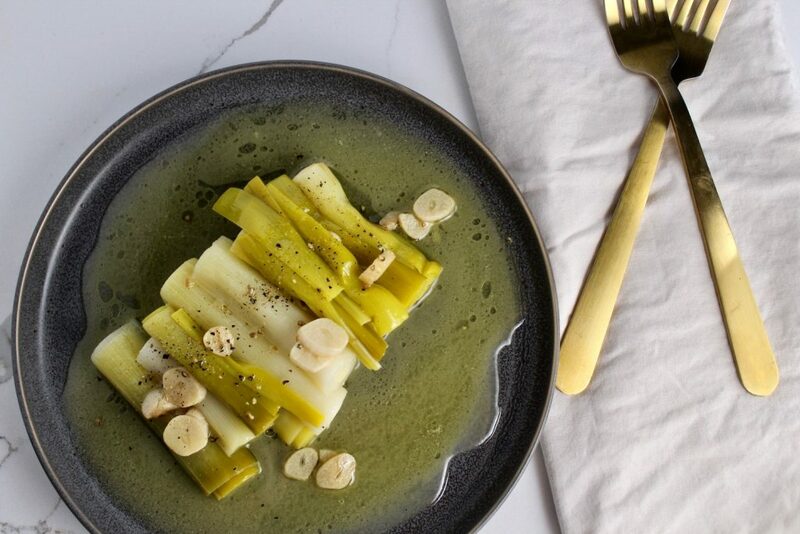 When was the last time you featured leeks in a dish? Maybe it was a side character in a risotto or you treated it like an onion on a pizza. They are often considered an afterthought. 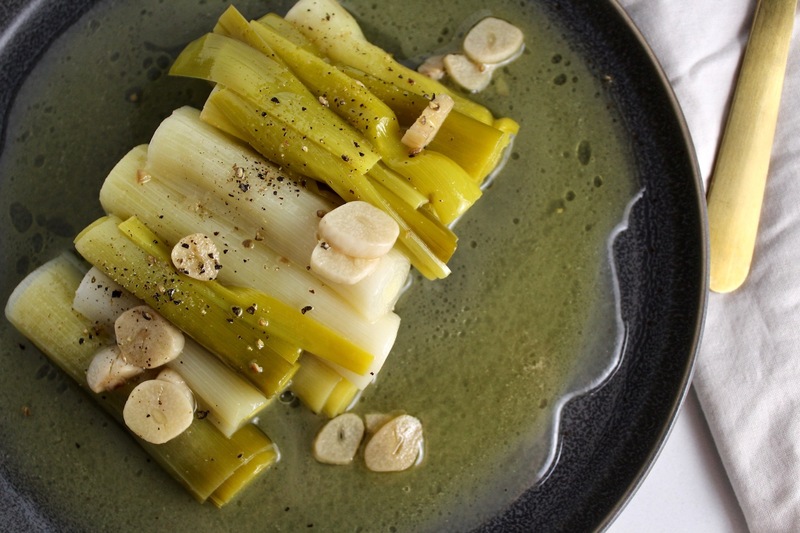 But leeks are special in their own right – and they are in season! – this recipes makes them the star of the show. Turns out when you slow cook them in a butter sauce, they turn into a soft and delectable treat. 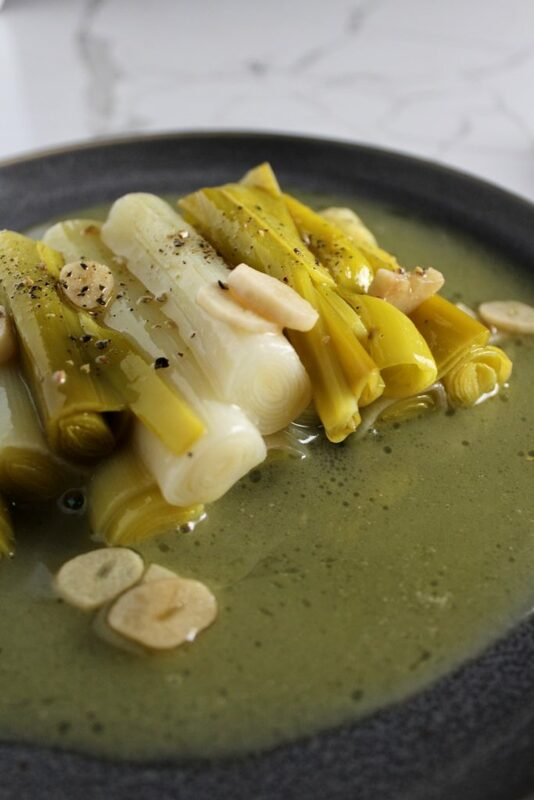 I’ve learned that many Spanish dishes are served at room temp (not sure why yet), which is true for these Slow Cooked Butter Leeks. 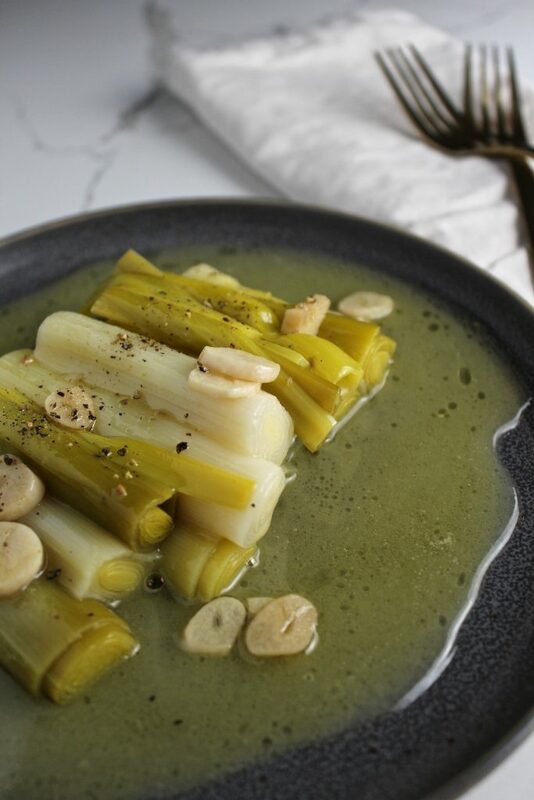 The taste almost gets…more intense when the leeks are allowed to cool a bit. Topping them with warm garlicky butter sauce helps liven them up, in just enough time for you to scoop one up onto a piece of bread or straight to your face. This also allows you to prep any other dishes while the leeks hang out. I served this with Spanish Rice with Wild Mushrooms. A piece of chicken or fish would make a great pairing. Make sure to serve with a giant piece of crusty bread to soak up all the remaining sauce. This recipe produces a lot of extra sauce – use it on chicken, fish, pasta, more leeks! – whatever you think is deserving of silky smooth garlicky butter sauce. I picked this recipe up from “Rustica: A Return to Spanish Cooking” by Frank Camorra and Richard Cornish. 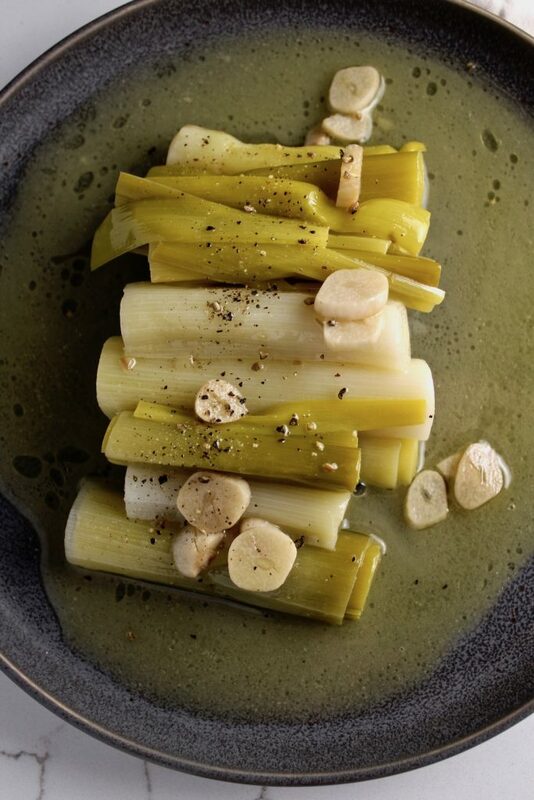 *To achieve the most luscious and soft butter leeks, you’ll want to select those that are on the smaller end, and the layers are tight and close to each other. Start by trimming the roots and tops from your leeks. If there are any outer layers that are tough, remove these (1-2 layers most likely). Cut the leeks in half cross-wise so you have 12 2-4 inch leek segments in total. In a medium saucepan, heat your olive oil on medium heat. Add your sliced garlic cloves and saute for 2 minutes. Add the bay leaves and leeks in a single layer. Add the wine, butter, a pinch of sea salt and enough water to cover the leeks. Increase heat to high, then cover the pan and simmer on low for 50-60 minutes. Carefully remove the leeks onto a plate when very soft. Increase the heat on the pan to medium-high. Reduce the cooking liquid, without a cover, for about 15 minutes. Drizzle the top of the leeks with your reduced sauce. Crack some fresh black pepper on top. Serve at lukewarm temperature and a giant piece of crusty bread to soak up the excess sauce.